Before we begin, I’d like to give a definition of interlinking. In general, interlinking is the act of connecting pages of the same website together using hyperlinks. Hyperlinks can be found in many areas of a website – the breadcrumb area, footer, navigation bar, etc. – but, for the purpose of this article, we’ll be talking about hyperlinks in areas of the page where unique content is located. In other words, we’ll be talking about hyperlinks in the body text and how interlinking can help you create a smooth conversion funnel and rise in search engine rankings. First, let’s talk about the two parties we want to serve, starting with the most important. At the end of the day, people buy your products and services – search engines don’t. Which is why it’s so important to make your website’s visitors your number one priority. 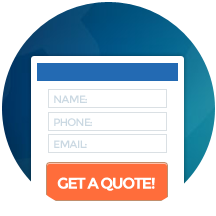 To do this, write the copy for your service or product page with only your customer in mind. Leave search engine ranking factors out of it. Forget about keywords, forget about interlinking, and forget about H1, H2, and H3 tags. As you write more and see what your prospects and search engines respond to, you’ll become better at serving people and Googlebots at the same time. The Googlebot is the web crawler responsible for deciding how and where your site’s pages appear in SERPs (Search Engine Results Pages). Even if you aren’t concerned about rankings (which would be very surprising), you need to be concerned with the Googlebot if you want to be found at all in SERPs. In order to have new pages show up in SERPs, you need hyperlinks on indexed pages to link to newer pages. Essentially, the Googlebot follows the hyperlinks on older pages to find newer ones. Say you create a sales page for a new product and publish it. The sales page shares the same root domain (www.rootdomain.com) as the other pages on your website, but, other than that, is its own entity. In order for the Googlebot to find the page and, in turn, have people find the page, you might put a link on your standard product/service page. For instance, if we created a sales page for our lead acquisition enhancement service page, we would link to the sales page from the service page. 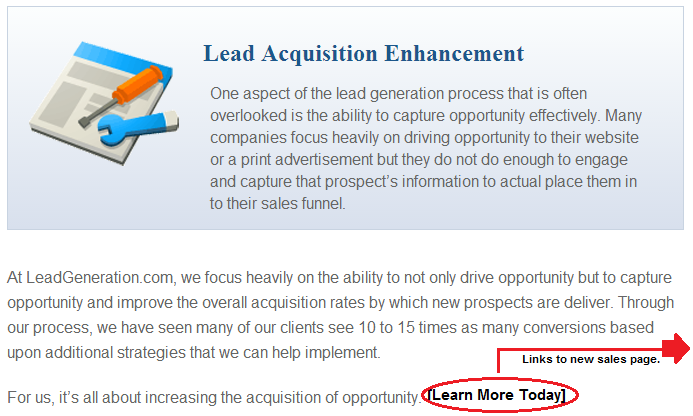 Inserting the simple “[Learn More Today]” link would allow the Googlebot to find the sales page, given that our Lead Acquisition Enhancement page is already indexed by Google. And after the Googlebot finds it, anything could happen. The sales page could rise instantly to the top of SERPs (unlikely, but it’s happened before), or it could just be indexed. And we’d gladly take the latter, because we can change the ranking of an indexed page. We cannot, however, change the ranking of a non-indexed page because, as far as Google is concerned, a non-indexed page does not exist. It’s important to remember that when a page goes unseen by Google, it goes unseen by the millions of people who use search engines to locate services online every day. This is a prime example of how putting people ahead of rankings can actually help rankings. When you improve the conversion funnel of your website with effective interlinking, you improve your chances of gaining leads. You also improve your chances of having more of your pages rank highly in SERPs. First, let’s focus on guiding visitors down the conversion funnel and gaining leads. One thing you need before interlinking the body text of pages is valuable information. This all goes back to writing for people instead of search engines. Instead of stuffing keywords into a page’s body copy and breaking your readers’ interest, focus on the audience. Empathize with your reader and write what you would want to read. You can worry about optimizing the copy after it’s complete. After your pages are filled with awesome, conversion-worthy copy, you’re ready to start interlinking. Link from the top down (see chart below). 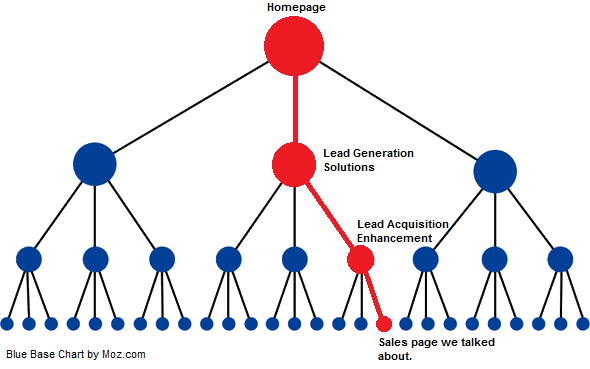 A linking hierarchy that would serve as a valuable way to generate leads AND rankings would look something like the chart below. The chart above represents the optimal structure for a website according to Moz. Moz, a digital SEO software company, recognizes this linking hierarchy as pivotal for SEO. And as we mentioned above, it’s the same structure that generates the most leads when hyperlinks are placed effectively in body copy. The reason this structure is the best for SEO purposes can be summarized by Moz’s Googlebot graphic (keep in mind that the Googlebot is also referred to as a web crawler or spider). Let keyword-rich anchor text come naturally. Google is always releasing new updates that penalize spammy websites, and one of the biggest indicators of a spammy website is its association with anchor text that’s solely keyword-based. For instance, if all the links pointing to our Lead Acquisition Enhancement page read “lead acquisition enhancement,” Google might penalize your site. While it’s okay to occasionally link down using anchor text that only contains the keyword, you should try to diversify the anchor text in hyperlinks pointing to each of your website’s pages. Link to sub-pages. This relates to the “optimal structure” we were talking about. Try to link to 1 or 2 relevant pages that are further down the chain. This will help web crawlers and people find your awesome service/product pages. If you have any questions about the interlinking strategies we talked about today, feel free to leave a comment. And if you have any insight regarding interlinking that was left unsaid here, by all means, share!